Mortadella is characterised by a nutritional profile that makes it very suitable for a varied and balanced diet. As confirmed by Inran1, opinions on this renowned Emilia’s cured meat have changed thanks to the important role of proteins in man’s diet and its renewed balance of fat, containing 60% of unsaturated fats. All Felsineo mortadellas represent a great source of proteins. Proteins have an important role to play in all the different stages of life. Suitable to all children and adolescents, adults and the elderly alike, mortadella is appetizing and easy to chew. The cooking of the meat permits the consumption of this delicious cured meat, in total tranquillity, also in delicate periods of life as, for example, during pregnancy. The fat profile in mortadella is well balanced, featuring a preponderance of unsaturated fat acids. All products have constantly evolved and improved over time, excellently embodying the attention given by Felsineo to consumer health, without compromising flavour. The simplicity and authenticity of Felsineo’s mortadella recipe – that excludes additives such as glutamate and polyphosphates, as well as colourings, sugar, milk derivatives, gluten and artificial seasonings – are ‘combined with particular production processes that ensure the mortadella’s unmistakeable flavour and lightness. The enzymatic lysis and microbial fermentation, together, confer the subtle flavouring and fragrance typical of the product range. … created to celebrate 50 years of experience, is produced using only the best Italian pork cuts, slowly ground, as in the past. The innovative production technique confers a characteristic fragrance, delicate taste and unique texture, guaranteed also by the use of only the finest ingredients. This exceptional product distinguishes itself by a high protein content and a low fat profile. In fact it has only 19% of fat, of which 7% of saturated fat, making the 1963 Mortadella Artigianale a delicious protein source suitable for a well-balanced snack or a second course to complete a main meal. … is an all natural mortadella with only natural ingredients. The constant focus on consumer needs has guided Felsineo to develop –the first – a cutting edge recipe, without artificial preservatives. 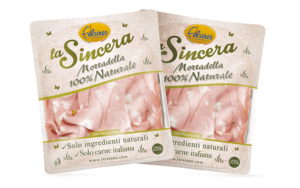 Produced using Italian pork, La Sincera does not contain added nitrites. 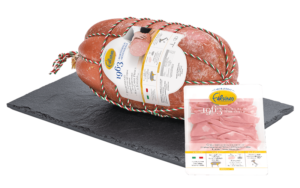 Felsineo is the first producer of mortadella to use only natural preservatives, instead of chemical additives, for the benefit of consumer wellness. Sodium nitrite, traditionally used, has been replaced by celery, carrots and blueberries vegetable extracts that ‘naturally’ contain nitrates. A rosemary vegetable extract has been chosen instead of sodium ascorbate as the antioxidant, necessary to increase shell life. (1) New nutritional values of Italian cold cuts deriving from the analysis carried-out by INRAN (National Research Institute for Food and Nutrition, today denominated CRA-NUT) and by SSICA (Experimental Station for the Food Preserving Industry).